President Donald Trump Tuesday criticized rapidly mounting global condemnation of Saudi Arabia over the mystery of missing journalist Jamal Khashoggi, warning of a rush to judgment and echoing the Saudis' request for patience. In an interview with The Associated Press, Trump compared the case of Khashoggi, who Turkish officials have said was murdered in the Saudis' Istanbul consulate, to the allegations of sexual assault leveled against Supreme Court Justice Brett Kavanaugh during his confirmation hearing. "I think we have to find out what happened first," Trump said. "Here we go again with, you know, you're guilty until proven innocent. I don't like that. We just went through that with Justice Kavanaugh and he was innocent all the way as far as I'm concerned." Trump's remarks were his most robust defense yet of the Saudis, a U.S. ally he has made central to his Mideast agenda. They put the president at odds with other key allies and with some leaders in his Republican Party who have condemned the Saudi leadership for what they say is an obvious role in the case. Trump appeared willing to resist the pressure to follow suit, accepting Saudi denials and their pledge to investigate. Jamal Khashoggi, a Saudi journalist and Washington Post contributor, is feared dead after he entered the Saudi consulate in Istanbul last week and has not been seen since. Khashoggi has been a vocal critic of Saudi Crown Prince Mohammed Bin Salman. Khashoggi went to the consulate to pick up paperwork in order to marry his fiancee. After speaking with the king, Trump floated the idea that "rogue killers" may have been responsible for the disappearance. The president told AP Tuesday that that description was informed by his "feeling" from his conversation with Salman, and that the King did not use the term. In Turkey earlier Tuesday, a high-level Turkish official told the Associated Press that police investigators searching the Saudi Consulate had found evidence that Khashoggi was killed there. Also Tuesday, Secretary of State Mike Pompeo met with the king and crown prince in Riyadh and said the Saudis had already started a "serious and credible investigation" and seemed to suggest it could lead to people within the kingdom. The secretary of state noted that the Saudi leaders, while denying knowledge of anything that occurred inside the consulate, had committed to accountability "including for Saudi Arabia's senior leaders or senior officials." Trump said he hoped the Saudis' own investigation of Khashoggi's disappearance would be concluded in "less than a week." 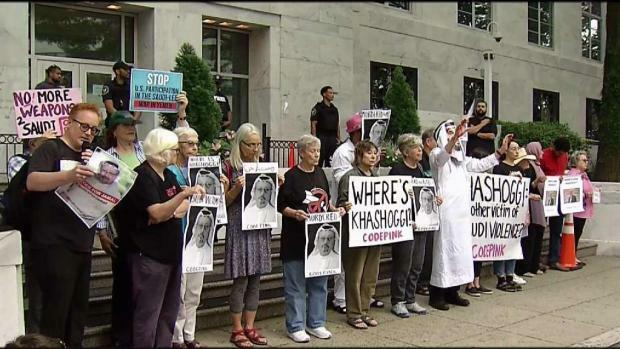 Demonstrators gathered in front of the Embassy of Saudi Arabia in Washington, D.C., Wednesday to protest Saudi and American responses to the disappearance of Washington Post columnist Jamal Khashoggi. News4's Chris Gordon reports. Also Tuesday, Turkey revealed new information about members of the Saudi hit team it says traveled to Istanbul to kill Khashoggi, providing NBC News with scans of the passports they allegedly used to enter the country. In the meantime, there were signs at home that Trump's party was growing uncomfortable with his willingness to defend the Saudis. In an interview with Fox News, a prominent Trump ally in the Senate called on Saudi Arabia to reject the crown prince, known as MBS, who rose to power last year and has aggressively sought to soften the kingdom's image abroad and attract foreign investment. "This guy has got to go," said Sen. Lindsey Graham of South Carolina, turning to speak to the camera. "Saudi Arabia, if you're listening, there are a lot of good people you can choose, but MBS has tainted your country and tainted himself." Khashoggi, a Saudi citizen but resident of the United States, has been a contributor to The Washington Post and a critic of Saudi leaders, especially Crown Prince Mohammed. International leaders and business executives are severing or rethinking ties to the Saudi government after Khashoggi's high-profile disappearance. Trump has resisted any action, pointing to huge U.S. weapons deals pending with Saudi Arabia and saying that sanctions could end up hurting the American economy. He said it was too early to say whether he endorsed other countries' actions. "I have to find out what happened," he said. But his complaint about "guilty until proven innocent" and comparison to the Kavanaugh situation suggested he was giving the Saudis more leeway than other allies. Khashoggi, 59, had been living in the U.S. for a year in self-imposed exile and writing columns for the opinion section of The Washington Post. Trump said Treasury Secretary Steve Mnuchin's trip to attend a Saudi investment conference is still on but could be canceled by Friday depending on what the investigation finds. "I think we'll also be guided by what other countries are doing," he said.